At Healthy Feet - Foot and Heel Pain Clinic, Foot orthotics can be prescribed by using the most technically advanced equipment available anywhere in the world today. The 3D Optical Laser Foot Scanner and computer system is just one innovative method I use against foot pain in the digital foot clinic. The 3D Optical Laser Foot Scanner accurately measures thousands of points on the foot's many contours to create an accurate end product and an orthotic shell that is guaranteed for life. The real-time interactive image displaying dimensions and rotating 3D views is then transmitted to computers in the laboratory for accurate, reliable and repeatable orthotics. When patients book with the clinic, they have the knowledge that the Podiatrist has over 30 years experience treating feet and foot pain with both the NHS and private practice. I am registered with the Health & Care Professions Council. At Healthy Feet - Foot and Heel Pain Clinic, I offer innovative specialized treatment for patients of all ages from infants upwards! The prescription orthotics are made to the highest standards available using modern technology, are completely accurate and provide the very best corrective treatment available. The 3D Optical Laser Foot Scanner replaces the need for traditional plaster casting and drawing around the foot, methods still in use today which are messy, inaccurate, costly and utilizing materials of limited life, requiring frequent replacement. Healthy Feet is the only permanently based Foot and Heel Pain Clinic to specialize in this method outside the USA and in the South West of England which means patients no longer need to travel substantially long distances for this specialized treatment. The shell manufacturing is carried out by a specialist laboratory using precision engineering. Only the most advanced materials are used in the shell manufacture and these are guaranteed for life against cracking or splitting. Appointments for the prescription orthotics generally last for one hour in this well equipped state of the art clinic, during this time, I carry out a full biomechanical assessment using a skeletal balance system to ensure that the orthotics are right for you and to get to the root of the problem. 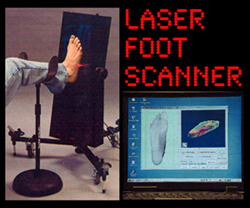 A 3D Optical Laser Scan is also taken of your foot in a neutral position. This information is then sent to the labs the same day for manufacture. I'll invite you back once I receive your completed orthotics for your free fitting. REMEMBER YOUR FEET ARE THE FOUNDATION FOR YOUR ENTIRE BODY. Obtaining and consistently wearing orthotics can be the best investment you could make in your overall well being. 01297 631043 - I'm here to help YOU!